The temperature has dropped a degree or two today and our birds have been focussed on the suet feeders. 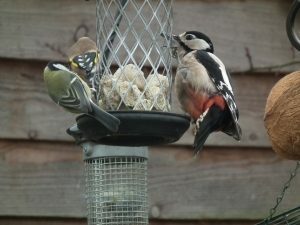 There was an interesting item on last Sunday’s Countryfile all about the 3 UK species of woodpeckers which lived up to their reputation as being quite illusive and were very camera shy during the feature. 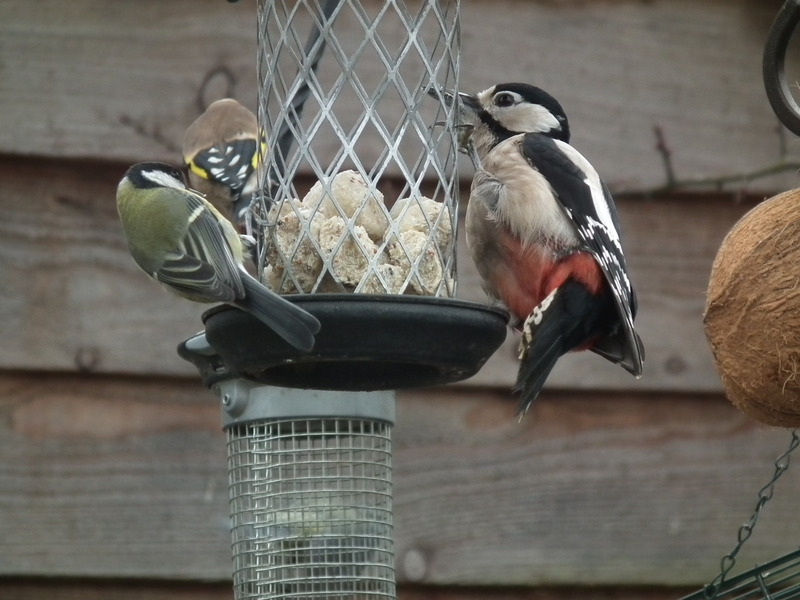 With a little patience however and ensuring a supply of quality fat balls or suet logs are available to entice them, if you are lucky enough to have a woodpecker in the garden they will grow in confidence over time and visit more frequently. The adults feeling more secure, will then often bring their young offspring along during the season and feed them morsels from the bird feeder which is a great sight. The photo below is of a female Greater Spotted which has been visiting the fat balls throughout the day. You can tell she is a female as she only has red on the rump, with the male of the species having a red head patch also.